Four truffles of Spanish dark chocolate surrounding chocolate mousse all drizzled with glaze. Dark & Milk Spanish chocolate served with cinnamon sugar churro bites for dipping. 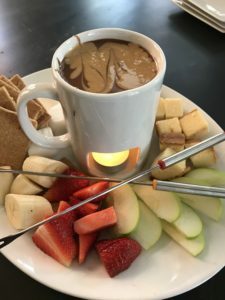 Melted chocolate for dipping apples, bananas, strawberries, pound cake, and marshmallows. (Choose Dark or Milk)...Or try Peanut Butter & Chocolate! 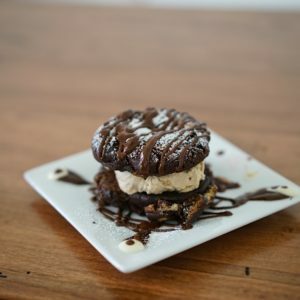 Two warm triple chocolate cookies with a whipped espresso cream center, then drizzled with warm chocolate sauce. Three ooey gooey soft chocolate chip cookies served with a shot of ice cold milk. 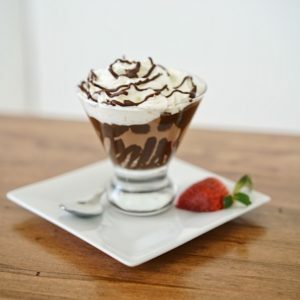 Layers of vanilla ice cream, chocolate mousse and whipped cream. So smooth and rich, you'll need a spoon. **Try our new vanilla crepe with lemon cream cheese and strawberries! Made from grass grazed milk and super smooth, this ice cream is the perfect combination of salty & sweet. How can this be Gluten Free? That's what you will say when you bite into this warm brownie with a peanut butter top and bottom.